FILE - Sierra Leone President, Ernest Bai Koroma, left, and Liberia President, Ellen Johnson Sirleaf, right, on arrival for talks with President Yahya Jammeh, in Banjul, Gambia. “They lied to us. The government betray us," the artist sings. FILE -Joseph Nyuma Boakai, Sr., Vice President of Liberia, arrives for a dinner hosted by President Barack Obama for the U.S. Africa Leaders Summit, Aug. 5, 2014. 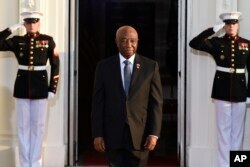 But Vice President Joseph Boakai is among the front-runners. The ruling party candidate has made infrastructure the cornerstone of his campaign. “I am still searching, I have not found somebody yet," Judy Degonteh Williams told VOA. “We Liberians, we were hoping that the UP-led government would liberate us from the hands of poverty ... but the UP government failed us," opined Maxine B. Kennedy. “I do not have nobody on my mind for presidency ... I do not trust anyone,” confided Mercy Angeline Green.